“I Do not Like Mondays” is not only a song of the “Boomtown Rats”, but it was in the Premier League so far the motto of Watford (10th place, 46 points). Of the 15 Monday matches only two were won (2-5-8). In April 2007, there was a 4-2 draw against Portsmouth and a 4-1 win over Chelsea in February 2018. At Watford vs Arsenal, our tip is a Hornets success, even though Arsenal (fifth, 63 points) has won seven of the last eight Premier League games on Monday and lost only to Crystal Palace in April 2017. “I do not like away games” is not a song title, but currently pretty well describes the season of the Gunners. Home a power and currently probably one of the best home teams in Europe. But away Arsenal could gamble the Champions League participation. Last week there was a 0: 1 at Everton. A game that Arsenal could well have lost with three or four goals difference and a game in which the replaced Mesut Özil threw his track jacket towards coach Unai Emery. Whether Özil is a candidate for the performance on Monday night at Vicarage Road, Emery will have to think carefully. If Saturday and Sunday are unfavorable to the Gunners, Arsenal could only find themselves sixth on the day before kick-off. An away win in Watford is therefore actually mandatory. At Watford vs Arsenal, however, our prediction looks like a home win for the black and yellow striped Hornets. Last Sunday was a historic day for everyone who cares about Watford Football Club. The Hornets reached the finals in the FA Cup only for the second time after 1984. Even a 2-0 deficit against the Wolverhampton Wanderers Watford could not pinch. Troy Deeney & Co. turned the game and eventually won 3-2 after extra time. Especially captain Deeney was in a very emotional interview after the game to note how much this victory meant to him. In the Premier League Watford is still in the race for the seventh place in the table, but his right to the Europa League qualification Watford would not really be happy. Because that would mean Manchester City wins the FA Cup final. Watford has already scored 19 competitive matches this season, most in a Premier League season since 1986/87 (then 23). At home Vicarage Road, Watford have been unbeaten in five Premier League games, winning the last three in series (two draws). The momentum currently speaks for the Hornets, yet Watford is against Arsenal, according to odds bookmakers only outsiders. The last four home wins in a row in a Premier League season were for Watford in December 1986. If we are right at Watford vs Arsenal with our prediction, the Hornets draw this record. Because at Watford vs Arsenal our tip is: home win. The goals for this could be achieved by mentality monster Troy Deeney, who has already scored nine times in this Premier League season. Deeney was better only in the 2016/17 season (ten goals) and 2015/16 (13 hits). Deeney could further extend his legendary status and become the third player in club history to score at least ten times in three different first division seasons. Previously, Luther Blissett (thrice) and John Barnes (four times) did it. Gerard Deulofeu, who turned on Wolverhampton after being substituted, was replaced limping last week. His use is questionable. Ben Foster returns for goalkeeper Gomes. There are a lot of positives in the first season under Arsenal new coach Unai Emery. Already, the Spaniard draw the point yield of the previous season. At home, the Gunners are a power and won the recent ten home games in series. In the calendar year of 2019 Arsenal scored the fourth-most counters (25) and in the Europa League on Thursday evening the equally important as heavy home game against Napoli could be won 2-0. This leaves Europe League expert Emery (three titles in a row with Sevilla) the back door to the Champions League further open. Before the season, probably few fans would have expected the premier class participation in the first year, but after Arsenal meanwhile had it in their own hands, the missing would be a disappointment. The reason for this is to look in the away performances. Arsenal have lost seven of the past eleven games abroad (2-2-7). The Gunners on Monday night at Watford against Arsenal, judging by the odds of bookmakers, are favorites to win, but we do not share that view. We would place a tip on the Hornets at Arsenal vs Watford. Arsenal is next to Ipswich Town (Championship) one of only two teams in the top four English leagues, who have not remained without conceding throughout the season away. At Arsenal, this dilemma now lasts 15 games (5-4-6 = tenth in the guest table). Between April 1984 and February 1985 Arsenal remained already 16 away games in a row without zero-game. Only one of the five Premier League away wins this season could be celebrated against a team that was better placed on the day than ranked 16. In November, it was against the then Eighth Bournemouth a 2-1. Pierre-Emerick Aubameyang is Arsenal’s top scorer this season with 17 goals. However, the Gabonese met last time on Boxing Day at Brighton in the foreign. The youngest five away games he was without a goal. Sokratis Papastathopoulos missed the next two games due to a yellow-barrier, as he saw his tenth yellow card against the Toffees. Only Patrick Vieira (1996/97) and Shkodran Mustafi (2016/17) have seen more yellow cards than the Greek (both eleven). For Lucas Torreira is eligible to play again and could move for the ailing granite Xhaka into the team. Rob Holding, Danny Welbeck and Hector Bellerin are injured. Watford has lost four of the past five Premier League home games against Arsenal (one win). This victory was last season at the Vicarage Road with 2: 1. Since November 1987 and a series of three defeats in a row, the Gunners have not lost two consecutive league away games against the Hornets. 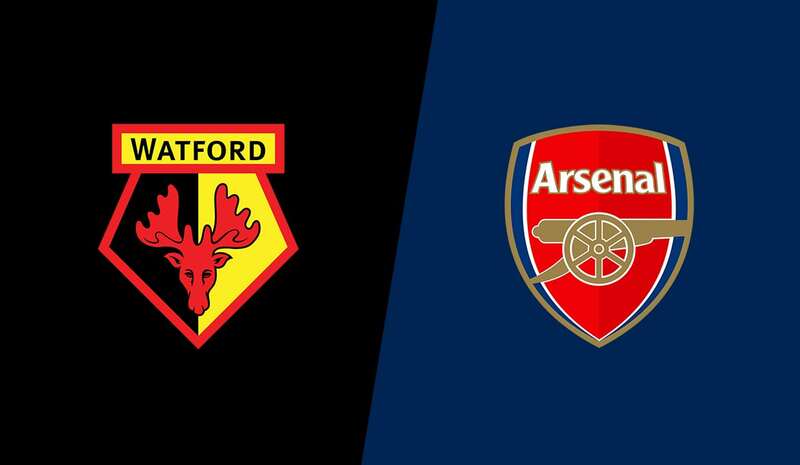 In none of the eleven Premier League duels between Watford and Arsenal, there has been a draw (nine Gunners victories, two Watford successes). Only four pairings were played more frequently in the Premier League and did not draw: Manchester United vs. Wigan (16), Aston Villa vs. Derby County (14), Derby vs. Leicester and Man United vs. Watford (both 12). Before you go on an start betting check the bet365 sign-up offer in 2019 ! The chronically outwardly weak Arsenal travels to Watford on Monday evening before the gates of London. The Hornets are currently full of confidence. In addition to reaching the FA Cup Finals Watford is unbeaten for five Premier League home games. So, between Watford and Arsenal, our prediction targets a tip in favor of the Hornets. Arsenal won in the Premier League only one of the past nine away games (1-3-5) and remained in this season in the stranger not even conceded. Nevertheless, the Gunners are at Watford vs Arsenal according to odds favors a success.